Saint Declan’s Way is a pilgrim walking route linking Cashel in County Tipperary and Ardmore in County Waterford. It follows the route that Declan took when going to Cashel to meet Saint Patrick in the fifth century. In turn, it is the way that Pilgrims have taken to visit Saint Declan’s monastery, holy well and grave in Ardmore for the past one and a half thousand years. The St. Declan’s Way Committee, a voluntary group with representatives from along the route, having been working since 2015 to revive this ancient pilgrim path. Work is progressing thanks to funding of €150,000 from the Rural Recreation Fund, Department of Community & Rural Development. We anticipate that the route will be fully signposted, waymarked and officially approved during 2019. Keep an eye on this website and the Facebook page for updates. Anyone who wishes to walk the route in the near future can book a place on a series of led walks being organised by Knockmealdown Active, who have been at the forefront of efforts to revive St. Declan’s Way. 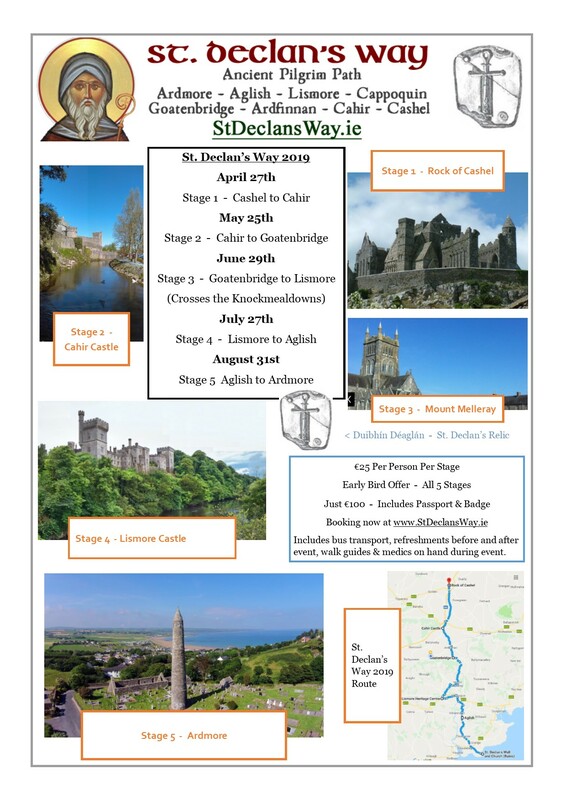 Booking for the 5 stages St. Declan’s Way 2019 (see brochure below) is now underway at www.StDeclansWay/Walks. You’ll find full details of the event here. Note: All early bird places have now been taken.